The middleweight division takes center stage this Friday, January 14, when ESPN2’s Friday Night Fights returns to Mallory Square in Key West, FL for a night of red hot action. In the main event, former star of The Contender and top-ten ranked Peter Manfredo, Jr. (36-6, 2 KOs) looks to position himself for another crack at a world title against the rugged veteran, Daniel Edouard (23-3, 14 KOs). In the co-feature contest, one of the hottest prospects in all of boxing, super middleweight Edwin Rodriguez (17-0, 13 KOs) faces the toughest test in his career and the son of a legend, Aaron Pryor, Jr. (15-2, 11 KOs). The Key West showdowns will be promoted by DiBella Entertainment and DEJ Promotions. The show will be televised LIVE on ESPN2, ESPN Deportes, and ESPN3.com. Manfredo, 30, is marking a decade as one of boxing’s most exciting attractions. Best known for his stint on season one of the reality show The Contender, Manfredo has stepped in with some of the biggest names in boxing, including Sergio Mora (twice), Alfonso Gomez (twice), Jeff Lacy, and the recently retired, Joe Calzaghe. His tenth round stoppage of Angel Hernandez this past May is considered a Fight of the Year candidate. Edouard, 30, is well known to fight fans for his showdowns with the likes of Dorian Beaupierre, Willie Gibbs, and Jermain Taylor. His fourth round stoppage over Gibbs in 2004, where both men hit the deck, was named ESPN’s Fight of the Year. Edouard is coming off a split decision loss to Alfonso Mosquera, but had won his previous five fights before that. Rodriguez, 25, is one of the fastest rising prospects in all of boxing. 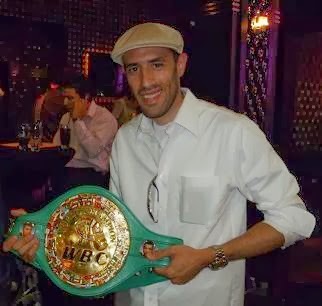 A former amateur standout, Rodriguez has won eight of his last nine bouts by knockout, including his last fight, a nationally televised destruction of James “Buddy” McGirt, Jr., which netted him the WBC USNBC Super Middleweight title. Pryor, Jr., 32, has more than just his last name going for him. Despite being the son of Hall of Famer, Aaron “The Hawk” Pryor, Junior has begun carving out his own niche in the sweet science. In his last bout on national television, he thoroughly dominated Dyah Davis (son of former world champion Howard Davis) over eight one-sided rounds. Pryor is riding a three fight win streak going into his showdown with Rodriguez. Hey man nice blog. I write about the NFL and NBA on my blog and have been looking for someone who writes on boxing topics. I will follow if you get a chance check me out at www.sportaholic2112.blogspot.com. Peace out.